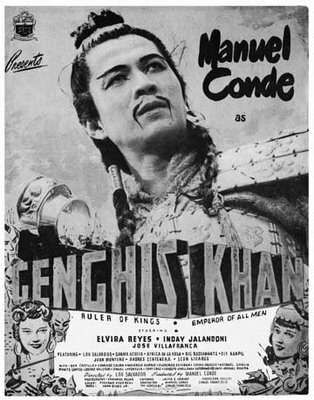 Genghis Khan (1950) is among the first real international breakthrough films made by a Filipino director. This bio pic directed by Manuel Conde is often described by film critics as a surprisingly engaging cinematic version of the life of the Mongolian warrior, Genghis Khan. Genghis Khan is also the first Filipino film, with the support of critic James Agee, to be screened at the Venice Film Festival, the world’s oldest film festival, in 1952. In Venice the film was cited for outstanding technical achievement. It also received good reviews at the 1952 Edinburgh Film Festival. The film also bears the distinction of receiving two reviews in the trade paper Variety. The first time for its Philippine debut in 1952, and the second time for its American distribution by United Artists in 1953. Shot with a shoe-string budget, Conde was forced to resort to creative means in staging the light, procuring the costumes and shooting the film. Despite the obstacles the film remained a classic for many years. Genghis Khan has also made it to the favorite list of many respected international critics for its innovative techniques and remarkable narrative elements using the cinematic medium. i’ve been looking for a poster of manuel conde’s genghis khan.. would greatly appreciate it if you can tell where i can get one..